Mid-summer never felt so hot with these fresh ideas for your home! The flowers are in-bloom, the BBQ is fired up and your social calendar is booked with one backyard party after another. Make the most of the season with these simple suggestions! Often neglected, the BBQ can be a breeding ground for bacteria and waste. Depending on how often it gets used, your grill should be cleaned every time you cook on it and come July, it’s in major need of some TLC. Roll up your sleeves and grab a steel wire brush to work out all the grease and food particles that reside in the grates, under the burners and on the lid. The best tip? Clean right after you’ve used the BBQ when it is still mildly warm. It will make your life a lot easier! Time to take advantage of all that “pre” season gardening you did in March! Stroll through your garden and pick flowers for a beautiful arrangement in your home. Since you will be saving on the expense of purchasing in a flower shop, adorn every room with some of your favorite blooms. If you skipped out on spring cleaning this year — as we all tend to do from time to time! — clean the windows in your home. Don’t try to do it on your own or else it will be September before you know it. Invest in a professional service for a one-day stint. You’ll be amazed at the results. Summers means heat and humidity, so contemplate making minor changes to your decor that will make your surroundings more comfortable. Change your bed linens from winter flannels to airy cotton blends or silks. Do your duty for the environment and give the air conditioning a break by buying a few stylish fans to place in and around your house. Whether you have a family or are part of a cozy couple, take a mini-vacation … in your own backyard. Pitch a tent, grab your sleeping bags and light your tiki torches. Summer only lasts three months so enjoy the environment around you and take advantage of sleeping under the stars! Get in touch with your inner Zen and host a beautiful outdoor tea party. The key is to keep it simple and clean and to surround yourself with the four elements of nature. Decorate the table with colorful stones, elegant fresh orchids, and tiny tea candles. Place a trickling fountain nearby, serve green tea in pretty cups and watch your guests soak up the tranquility. Take advantage of the warm breeze and sunny skies by planning a trip to your local park to fly a kite with your family. Pack a picnic lunch and you have the perfect way to spend a lazy Sunday afternoon. As soon as the weather warms, farmers markets and fruit stands pop up virtually everywhere in the city and in the suburbs. Traditionally only open for a limited run, jump on your bike (or yes, into your car if need be) and discover these hidden gems. Even if vintage chic isn’t your exactly decor mantra, garage sales are just a fun way to explore your neighborhood on a weekend. Don’t knock it until you try it; you really never know what you may find. 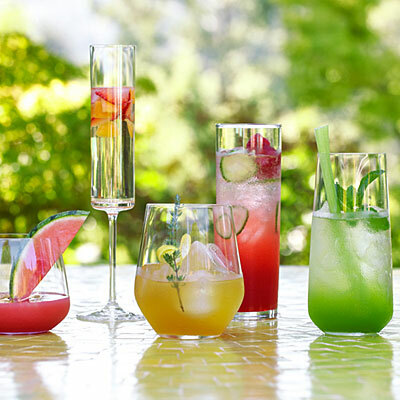 Backyard soirees are a dime a dozen come this time of year, so next time you host, try something different by having a cocktail pot-luck (with hors d’oeuvres, naturally). Invite a group of friends to create a new, season-themed drink (alcoholic or non) and have a judging panel choose the ultimate sipper. Remember, the summer is all about letting loose and having some fun. Don’t take it too seriously!